NASA space scientist James Mason and his team of NASA Ames Research Center and the University of Space Research Association in California have recently proposed a new theory to deal with the pieces of debris in the low Earth orbit (LEO) that are colliding with each other to create more pieces. They discovered a possible method of using a laser beam to change the velocity of the junk’s orbit by focusing the beam on it to slow it down and change its orbit. This can stop the debris from colliding with communications satellites or the International Space Station. The scientists mention that continual evaluation of the chances of a collision between two space debris of 5 cm or more in diameter would be needed using radar data from the US Space Surveillance Network. 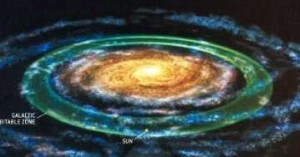 The junks on the path of collision would then be tracked by an optical telescope. One of them will be locked on and the release of the laser beam will occur. Just by using 5-10 kilowatts commercially available lasers mounted on 1.5 meter telescopes placed close to the poles, the risk of more than half of potential space junk collisions could be significantly reduced. The total cost of the scheme would be no more than $10m, making it a much cheaper alternative than other ideas such as direct removal of space debris. The new paper could give insight into how we can avoid the Kessler syndrome, where if more and more space junk are be created and colliding with each other, the generations of debris could ultimately render space exploration and satellite launches impossible. This prediction was done by a NASA scientist in 1978 and new solutions have been presented since then a lot with multiple complications and high price tags. Moreover, other countries involved in space exploration saw the proposed methods as threats to their functional satellites. Although a feasible theory, the scientists speculate whether this method could actually do the trick remains a topic of debate. Team member William Marshall points out that there are a lot of uncertainties in the model and space-debris models need to be run to be certain that the theory will be effective in the long term. 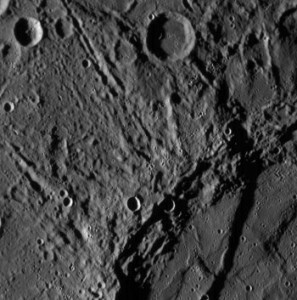 Image of Mercury from previous Messenger missions. 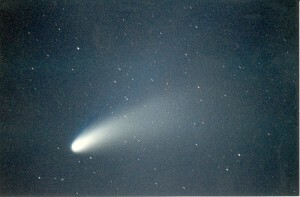 From NASA. 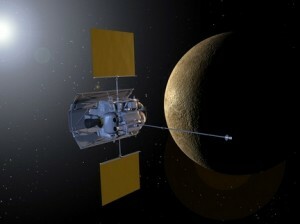 After years of planning and development, NASA’s space probe Messenger finally fell into Mercury’s orbit Thursday evening. At 9:10 p.m. of March 17, when the last rocket that projected Messenger shut off and the probe fell into Mercury’s gravity pull, scientists at the control room in John Hopkin’s University started in a round of applause. 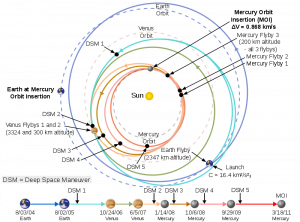 Mercury is the fifth planet that NASA spacecrafts have orbited. 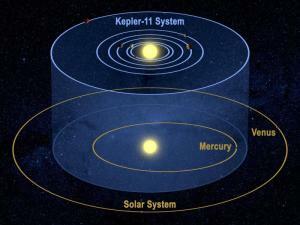 Mercury is the closest planet to the sun and lacks an atmosphere. This means that Mercury’s surface is super heated by the sun during daytime but drops to hundreds of degrees below freezing at night. Also, without an atmosphere, Mercury’s surface is heavily cratered. The vast temperature different implies that ice could be found inside the craters. The Mercury probe hopes to bring back a year of photography that would help in the research of the creation of Mercury and its composition. With this goal in mind, surveillance of the probe is needed for the next few days. 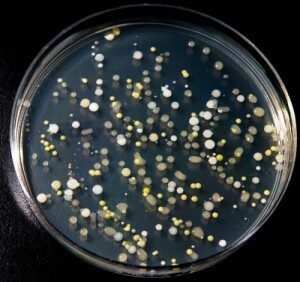 Constant checks on the probe’s health systems, testing of the scientific equipment that is on board is essentially so that the vast amount of data can be collected and transmitted back to Earth. This massive project started in 2004 with a budget of $446 million. Hopefully, the probe will bring back valuable data that would useful for planetary scientists to determine the evolution of Mercury. Messenger also hits close to UBC as one of the Earth and Ocean Science professors, Dr. Catherine Johnson, participated in the project. Dr. Johnson is a participating scientist in the project and hopes to discover the reasons behind Mercury’s magnetic field. The probe Messenger hopefully will gather data that will be of use to Dr. Johnson.